#TRIBE16 International art festival launches this weekend. Before nations and religions there were tribes. The definition of tribe implies living as one with the environment and others, to take only what’s needed and to give back. Artists from all over the world, we are still one tribe, and we have a huge role to play in the moral economy, not just the market economy, to influence society through the power that art has to focus on what unites people, fighting the antagonism we witness again and again. After a huge success from last Year’s #TRIBE15, featuring close to 100 contemporary emerging artists and open to over 2500 visitors In the Heart of London, Chrom­Art has announced its Second Edition #TRIBE16. Featuring over 100 international and UK ­based artists from the world of contemporary art, music, dance and performance this is a ‘living exhibition’ encouraging cross­disciplinary collaboration among artists from different backgrounds. The energy­ fuelled weekend includes FREE access for visitors to all activities. 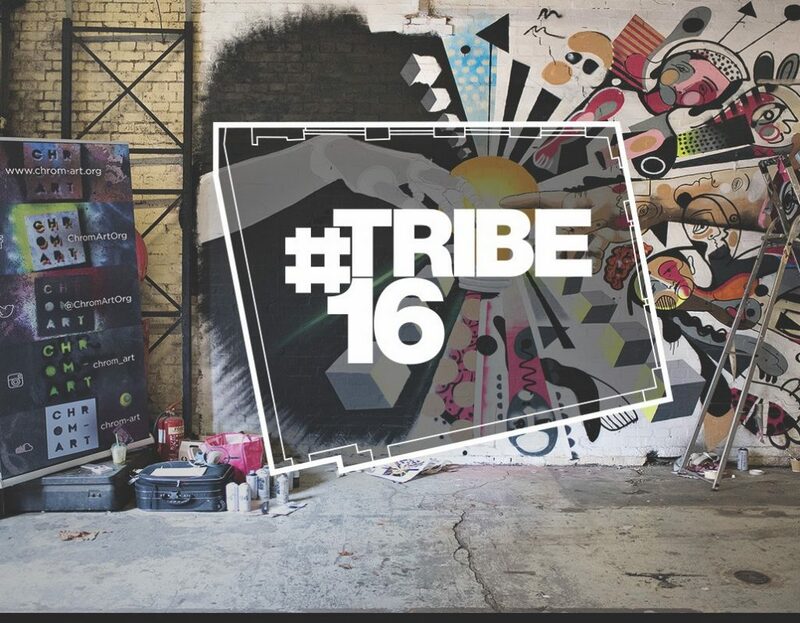 Conceived as an immersive multicultural festival engaging a diversity of art forms including 2D art works, sculpture, dance, graffiti, art installation, video and performance, #TRIBE16 will be held the first weekend of October (Friday 30 September ­ Sunday 2 October 2016) in one of the most exciting venues in the heart of London. UGLY DUCK 47/49 Tanner Street, a spectacular 12,000 sq.ft Victorian warehouse spanning over 3 floors and 5 different areas. Exploring the theme of the City Tribe and a New Sense of Urban Belonging, placed beyond social and political structures, #TRIBE16 Art Festival aims to combine a very rich offer of interdisciplinary artistic practices and to enrich the multicultural scene within the contemporary city landscape of UK and abroad. For the duration of the festival 47/49 Tanner Street will become a utopian space where notions of physical space and the limitations associated with it will be challenged through a dense network of multiple human relations and energies. Artists will be inviting visitors to take part in a variety of activities and seeking lively interaction with the public. Opening up new encounters, establishing a sense of community that goes beyond geographical limitations, #TRIBE16 becomes a playground for artists across genre where the multi­layered relationship between space and identity will be constantly tested. Headline Performances by the multi award winning IthacaAudio presenting also their jaw dropping installation The Storm. The Storm from Ithaca Audio on Vimeo. The most influential new project in the Spanish cultural scene, LA JUAN Gallery, pioneer of the first art gallery fully dedicated to live art in Madrid, is coming to London to present a unique immersive experience, collaboration between Spanish and UK actors and performers. Get ready to be surprised, maybe shocked, and definitely fully entertained!. Five renowned international street artists (Amara por Dios, Annatomix, Sr.X, Daniel Dalopo and Marc Craig) will showcase new canvas work in a specially dedicated area, joint by Tenbomb, one the most exciting street art collectives now in the UK. Chrom­Art Resident DJs will be playing soundtracks specially curated for the event. Visitors, families and young children can enjoy group painting sessions run by different artists. Fifteen­stall food court with be brimming with fresh, delicious international food from independent producers. Chrom­Art is a new London based Social Enterprise (Community Interest Company) that supports talented undiscovered artists of all disciplines in our local communities, and promotes the education of creativity for the public benefit. We are 100% volunteer run and operate a policy of applying all our profits to our social objectives. This entry was posted in EXHIBITIONS, NEWS and tagged #TRIBE16 Art Festival, Chrom­Art, LA JUAN Gallery. Bookmark the permalink.